Perfect for small parties and meetings, with access to the balcony and gardens. Capacity: up to 30 people. Perfect for recitals, dance space, parties, large meetings, and photo shoots, with lots of natural light. Capacity: up to 60 people. Perfect for wedding ceremonies and photo shoots. Capacity: 80-120 people. Perfect for meetings or parties, with access to a kitchen. Capacity: up to 60 people. View the room in person (recommended). Phone our rental coordinator at 604-257-8140 to arrange a time. Deliver your cancellation request in writing to the West Point Grey Community Centre main office. Community, non-profit, and commercial rates are available for groups that qualify. Please contact the Rental Supervisor at 604-257-8140 for details. You're responsible for setting up your event. Use painter's tape to put up decorations. Duct tape, scotch tape, packaging tape, and other tape is not allowed. Candles are allowed, provided you agree to pay for any related damages or costs. You're responsible for removing your decorations and personal items within 1 hour after all activities end. Large events include clean-up by staff as an additional charge. You will be charged $100.00 per hour if guests, decorations, and personal items remain after your rental ends. You're responsible for cleaning up within 1 hour after all activities end. You will be charged $100.00 per hour if you haven't cleaned-up and guests remain after your rental ends. Depending on the risk level assessed for your event, a minimum of $2 million liability with the City of Vancouver and the Vancouver Park Board named as additional insurers may be required. Higher risk events include receptions, adult parties, tradeshows, and so on. In most cases, we do not require insurance for group meetings or workshops where no high risk activities are involved. Catering is allowed (Aberthau does not offer catering services). The kitchen is available to warm food, but not to prepare and cook. 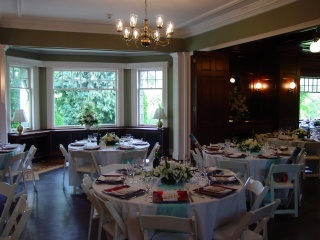 Food and beverages can only be served in the Oak Room, Lounge, Dining Room, and foyer. Beer and wine may be served with a valid Special Occasion License. This license must be posted near the bar area at the event. Hard liquor, spirits, and liqueurs are not allowed. Alcohol is not allowed outside the facility. All servers, whether paid or unpaid, are required to have either a Special Event Server Certificate or a Serving it Right Certificate. A licensed bartender is recommended for alcohol service at all weddings and social functions during bar service hours. If you serve hard alcohol at your event, you may be fined $250.00 and lose your damage deposit. Contact our rental coordinator in advance to arrange the delivery of your catering rental equipment. Deliveries are allowed from 8:00am to 10:00am on the day of your rental. This time is only for delivering rental equipment, not for dropping off decorations and belongs, or for setting up. The rental equipment needs to be picked up on the day after your rental from 8:00am to 9:30am.